Brow lift surgery, also known as forehead lift surgery, is performed to treat conditions associated with ageing. It could be done with other cosmetic procedures to achieve a more harmonious facial appearance. Also, younger adults who have a low brow or already have deep frown lines due to stress or over activity of muscles can use this treatment. Before the operation, your surgeon will perform a history check and physical examination. The examination includes your facial bone structure, brow position, eyelid and eye aesthetics, skin thickness, texture, and elasticity of your skin. This examination will be used to formulate a surgical plan and the procedure will be discussed. Generally, brow lift surgery has a few methods. You and your surgeon will decide the technique that you are most comfortable with and which has the lowest risk. 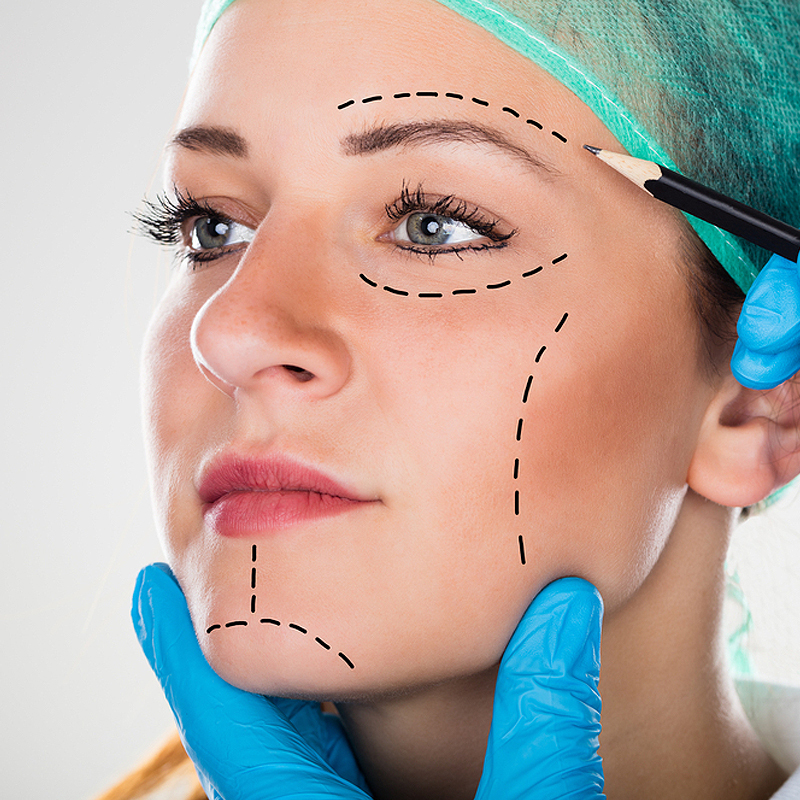 Your plastic surgeon will select the surgical technique that he or she feels will obtain the best outcome for you, based on your desire regarding the outcome of the result. Our advice is to quit smoking until your wounds are fully recovered after the surgery. Also, there are some medications you can not use before surgery such as aspirin, non-steroidal and anti-inflammatory drugs, because these will increase the risk of bleeding. If your hair is short, you may want it to grow out enough to cover your incisions until it is fully recovered. Any chemical processing of your hair should be performed prior to surgery since you cannot have any of these procedures for at least a month after the surgery. Your surgery will be performed in a fully equipped hospital. Medications are administered for your comfort during surgery by your surgeon. You and your surgeon will have to decide in advance what type of anaesthesia is required. Often general anaesthesia is used for this surgery. After surgery, your doctor will check your blood pressure, heart pulse and amount of oxygen circulating in your blood. After surgery, you will be taken to your room. A bandage may be wrapped around your forehead or face. Sometimes small tubes will be inserted beneath the skin to drain away fluid that might accumulate. There might be a little discomfort directly after the surgery. Any discomfort you may experience will be treated with medication. You are allowed to go home two hours after the surgery or you can rest in your hotel room and enjoy a short vacation. After the bandage is removed, you can feel puffiness and discolouration. Also, do not be alarmed by any unevenness or temporary asymmetry. It is a normal experience by this kind of surgery. Most swelling is usually noted in the first 24 to 48 hours, and most bruising resolves within two weeks. You can use makeup after one week. You may experience numbness to the forehead post-operatively, which usually resolves within several weeks. Straining, bending, and lifting should be avoided during the early postoperative period as these activities may predispose you to bleed. Your doctor will give you instructions that may include caring for the dressing and incisions, directions for your analgesics and other medications, specific concerns to look for, and when to follow up in the office to monitor your healing process. It will take several weeks for the swelling to fully resolve, and up to 6 months for the incision scars and bruises to fully fade. You should avoid direct sunlight and smoking. This surgery is performed to treat conditions associated with ageing. It could be done with other cosmetic procedures to achieve a more harmonious facial appearance. Also, younger adults who have a low brow or already have deep frown lines due to stress or over activity of muscles can use this treatment. The scars will be placed in your hairline so they will not be visible. They will fully fade out after 6 months. You are not allowed to dye your hair one month after the surgery, so you should do it before the surgery. In the first week after the surgery, you will have some swelling in the first two days and bruisings will be resolved in two weeks after the surgery. You are not allowed to do a makeup in the first week after the surgery. Temporary asymmetry is possible, do not panic. You should avoid straining, bending and lifting during the early post-op period as these activities may predispose you to bleed. You should avoid direct sunlight and smoking. The surgery lasts about one hour and is sometimes performed under local anaesthetic and sometimes under general anaesthetic. You can go to the hotel 2 hours after the surgery and rest.